Arelux Believes in the magic of the holidays. Batteries: 3 AAA, NOT Included. ✪ 300 Lights - This Christmas Tree Skirt features three Christmas Trees and Christmas gifts with total 300 optical fiber, illuminating the whole scene, make the entire scene come to life. Perfect as Christmas party decoration. 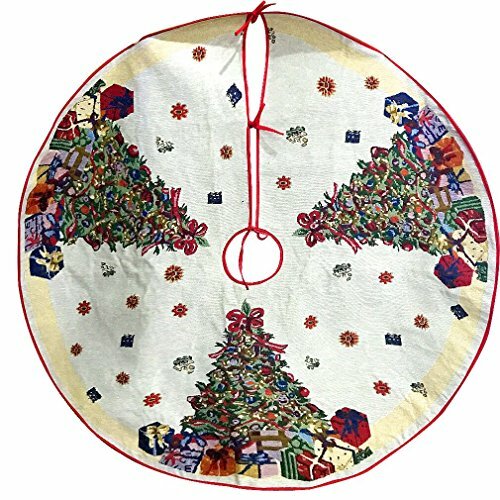 ✪ Super Size - The Christmas Tree Skirt measures 54" in diameter, bigger than the ordinary. Perfect to dress your tree and much room for candy of all kinds, small gifts and other presents. ✪ Three Ties - Three sturdy ties at the opening allow you to secure tree skirt in place underneath the Christmas tree and folds neatly to store with Christmas decorations. Greatly enhance holiday atmosphere. ✪ No Battery - 3 AAA batteries needed(not included in package), do not left it near a source of heat or near a naked flame, not suitable for washing. Include small electrical components, away from kids. ✪ Quality Warranty - "Arelux"offers quality guarantee and 5-star customer service. For those who have quality problem, we offer a 100% no risk money-back guarantee.